Venezuela – officially, the Bolivarian Republic of Venezuela (República Bolivariana de Venezuela) – is a tropical country on the northern coast of South America. It’s a continental mainland, with numerous islands located off its coastline in the Caribbean Sea. Venezuela possesses recognized borders with Guyana to the east of the Essequibo river, Brazil to the south, and Colombia to the west. Trinidad and Tobago, Grenada, St. Lucia, Barbados, Curaçao, Bonaire, Aruba, Saint Vincent and the Grenadines, and the Leeward Antilles lie just north, off the Venezuelan coast. Venezuela is known widely for its petroleum industry, the environmental diversity of its territory, and its natural features. The country is considered to be among the world's 18 most biologically-diverse countries, featuring an array of wildlife in a variety of protected habitats. Hammocks and dark, wooden handicrafts can be found throughout Venezuela – along with somewhat tacky, boldly-painted statuettes of big-busted women. Some areas, such as Falcón state, have a tradition of excellent glazed pottery, which make for wonderful purchases. Though Venezuela is entirely situated in the tropics, its climate varies from humid low-elevation plains, where average annual temperatures range as high as 28°C, to glaciers and highlands. Located in southeastern Venezuela in South America, Angel Falls is the highest uninterrupted waterfall in the world, dropping from the mesa of Auyán Tepuy in the rain-forest-covered Guiana Highlands. It was discovered in 1935 by the American aviator and adventurer James C. Angel, after whom it is named. Canaima National Park is a 30,000 km_ park in south-eastern Venezuela that borders Brazil and Guyana. It is located in the state of Bolívar, and roughly occupies the same area as the Gran Sabana region. It is the second largest park in the country, after Parima-Tapirapecó and is the size of Belgium or Maryland. Ciudad Bolívar is the capital of Venezuela's southeastern Bolivar State. It was founded with the name Angostura in 1764, renamed in 1846, and, as of 2005, had an estimated population of 338,250. The town lies at a narrowing of the Orinoco River and and is the site of the first bridge across the river. Los Roques is an archipelago of Venezuela, located in the Caribbean, at 168 Km north of La Guaira, Caracas´ port. For its beauty and ecological importance it was declared a national park in 1972. The archipelago has more than 50 islands. The most important, El Gran Roque is the only one populated and is where the airport is located. Mérida, in the state of Mérida, lies in the midst of two of Venezuela's Andean mountain chains. Founded twice, first illegally in 1558, and then at a different location as Santiago de los Caballeros de Mérida in 1560, Mérida is the home of Venezuela's second oldest university, the University of the Andes, founded in 1785. Margarita Island is the largest island of the Nueva Esparta state in Venezuela, situated in the Caribbean Sea, off the northeastern coast of the country. The state also contains two other smaller islands: Coche and Cubagua. The capital is La Asunción, located in a river valley of the same name. 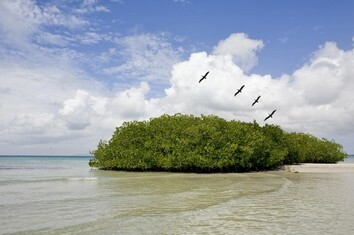 The park covers a portion of the coast and a chain of offshore islands east of Puerto La Cruz to Cumaná. The main attractions here are the beaches and the diving. The islands can be accessed by boat from Puerto La Cruz, Santa Fé, and Mochima. It is also possible to explore the mainland portion of the park by car or bus. Roraima is one of the highest tepuis (table top mountains) in Canaima National Park. It is also one of the most easily accessible and a popular hiking destination. Hiking to the top can be done as a minimum two day hike and camping trip. Playa Medina is touted as being one of Venezuela's best beaches and is one of the highlights of the Península de Paria. This crescent shaped beach is backed by an old coconut plantation. There are some inconspicuous cabanas at the far end of the beach but there is very little else in the immediate area. There are usually locals here selling fried foods and pastries. This beach is a little more remote. It is east of Playa Medina, several kilometers down a rough road. This long stretch of beach often has large waves and can be dangerous for swimming. There are a few cabanas here and camping is also an option.